The new version of Toyota's best-selling Prius hybrid will come with technology that allows it to talk to other vehicles and objects like traffic signals. It's one of the first examples of such technology being installed in a mass market car, and while it will be available initially only in Japan, the work there should help its introduction in other countries. It's possible in Japan thanks to the country's standardization on a single frequency for so-called "Intelligent Transportation Systems." The 760MHz band was freed up when analog TV broadcasting ended in Japan in 2011. At intersections equipped with the technology, traffic signals will beam data to cars about their status. So if the driver doesn't notice a red light, the car will automatically slow down because it knows it should stop. Additional sensors at intersections will monitor approaching cars and pedestrians crossing the street, so drivers should get a warning if they attempt a right turn across traffic (equivalent to a left turn in the U.S. and many countries) when a car is approaching, or if someone is crossing the street. And it doesn't only receive information. 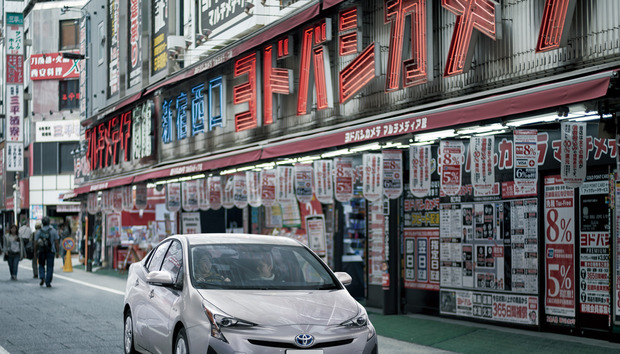 The ITS system in the Prius transmits data on the car's speed, acceleration and deceleration to vehicles behind that are equipped with the same technology. That means the car behind can more easily maintain a safe distance, speeding up and slowing down as the car in front does. The technology also receives data from transponders fitted to emergency vehicles, alerting drivers to their location and direction of travel so the road can safely be kept clear. Modern cars are already packed with safety features that attempt to warn about things like nearby pedestrians, but many are based on radar, so the pedestrian has to be in proximity of the car before a warning sounds. The new system will give a little more warning and could prevent situations where the radar-based system needs to bring a car to an emergency stop. Auto makers around the world are looking at similar technology as part of their research into ways technology can improve driving and make our roads safer. The ultimate goal is complete driving automation, but that may be decades away. In the meantime, technologies like ITS should help improve road safety.